Supporters of Shia cleric Moqtada Sadr have staged a mass demonstration in Baghdad in protest against plans to extend the US mandate in Iraq. An estimated 50,000 protesters chanted slogans such as "Get out occupier!". Iraqi and US negotiators drafted the deal after months of talks but it still needs approval from Iraq's government. Under the agreement US troops would withdraw by 2011, and Iraq would have the right to prosecute Americans who commit crimes while off-duty. The UN mandate for US-led coalition forces expires at the end of this year. 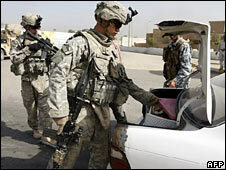 About 144,000 of the 152,000 foreign troops deployed there are US military personnel. 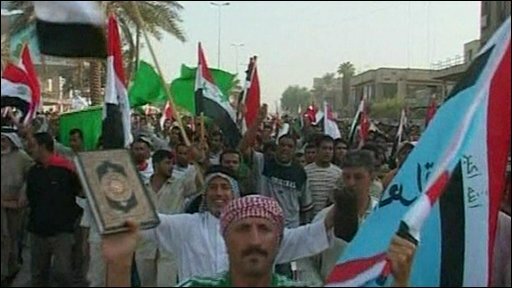 Chanting slogans and waving banners, tens of thousands of Shias, mainly young men, marched on the eastern suburb of Sadr City towards the centre of Baghdad. The BBC's Jim Muir in Baghdad says Moqtada Sadr's militant opposition to the US presence has strong grassroots support among many Shias - and this was a physical manifestation of that opposition. He says leaders of the 30-strong Sadr bloc in the Iraqi parliament will have expressed that rejection at a meeting of Iraq's Political Council for National Security late on Friday. The meeting of top political leaders and the heads of parliamentary factions was convened to discuss the draft agreement covering the US military presence after its mandate expires. No decisions were taken but the Council is to meet again to hear back from military experts on what is a very complex and detailed document. Our correspondent says its passage through parliament may follow naturally if it is approved by the Council, but this is by no means assured and a tough political battle is already shaping up. In Washington, US defence chief Robert Gates has been courting support for the deal from key members of Congress - although their approval is not mandatory.